And Christ remains the head of all. 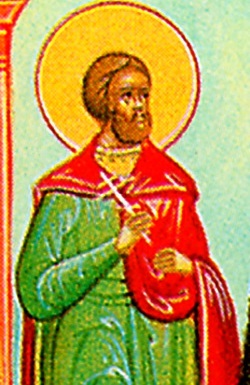 This Saint was a Christian from the time of his ancestors, and when he saw pagans offering sacrifices not only to men but to reptiles and disgusting insects also, he was inflamed with divine zeal, and at a time when the Greeks were celebrating a festival to the soulless idols, he hastened and overturned the sacrificial altar, and while he trampled on the sacrifices, he called himself a Christian. The pagans therefore immediately arrested him, and first they beat the Saint with thick rods, and struck at his mouth and teeth with rocks, then they dragged him by the hairs of his head. After this they bound him and delivered him to the governor, and he was tortured much by him, until he was finally beheaded, and the blessed one received the crown of martyrdom.